What does 50 Square Metre mean? 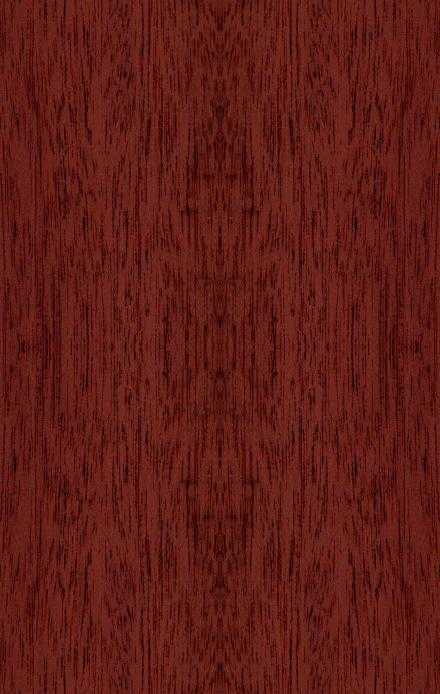 Click here for the answer! 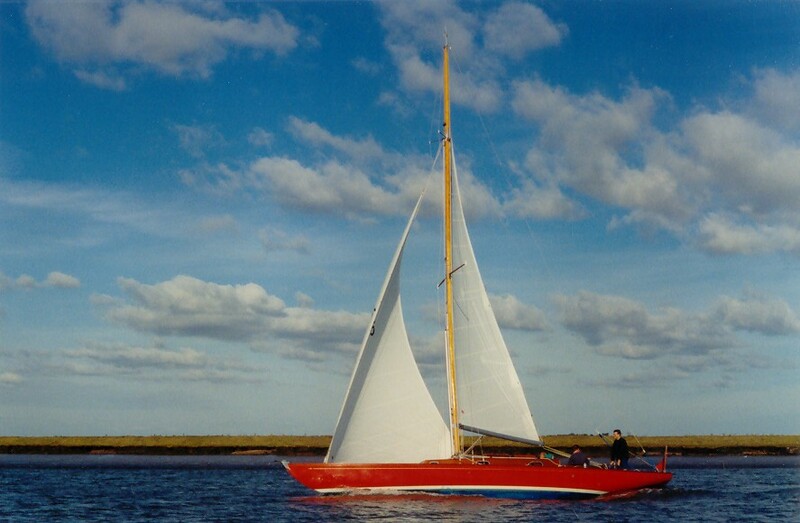 Designed by Karl Martens and built by Matthiesen & Paulsen in 1938 near Kiel as part of the German Naval fleet, Hiltgund was originally a training boat for naval personnel. 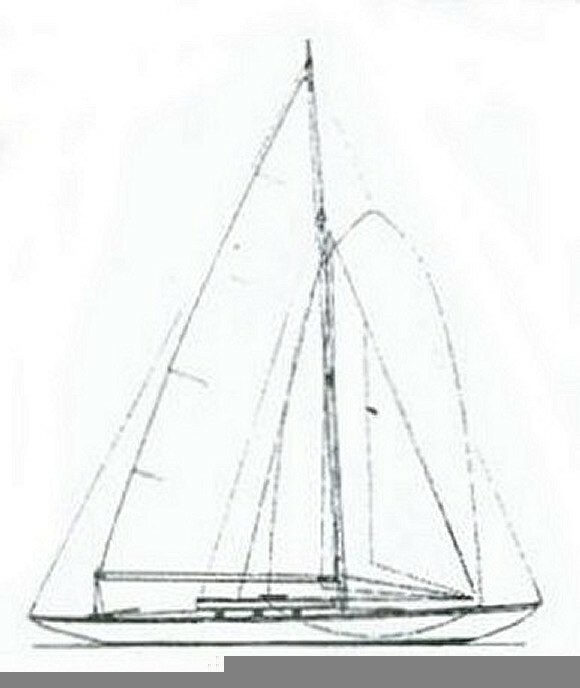 She first appeared in Lloyds Register of Yachts in 1939 when she was listed as owned by the Kriegsmarine and was registered at Cuxhaven. 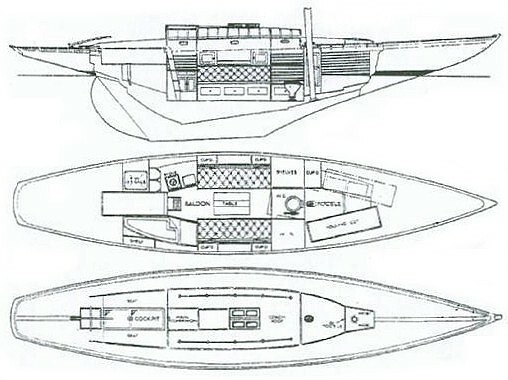 Under Admiral Raeder, the Kriegsmarine (German Navy) placed large orders with a number of yards to expand the fleet of training yachts and dinghies between 1935 and 1939. 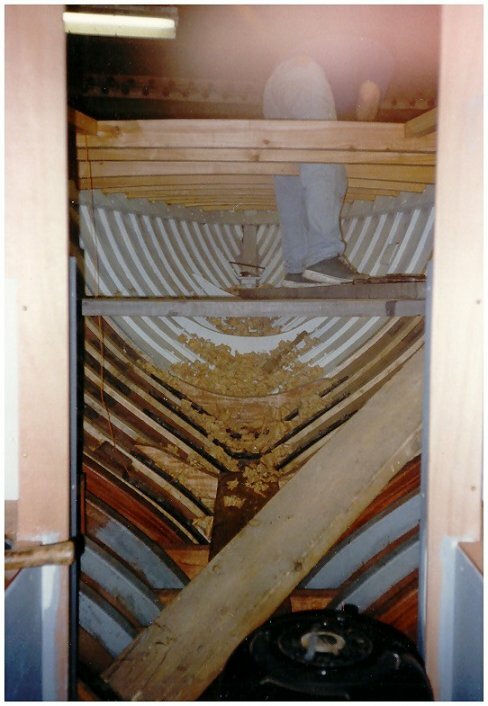 Experience in small boats was known to be very beneficial for building up seamanship, self reliance and an understanding of the sea. 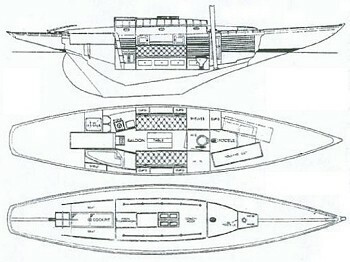 During the period when limits were in place on the size of German armed forces after the Treaty of Versailles in 1919, the size and number of warships permitted was strictly controlled. 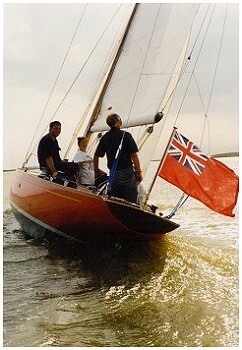 Training yachts offered a loophole whereby naval personel could gain valuable experience at sea. 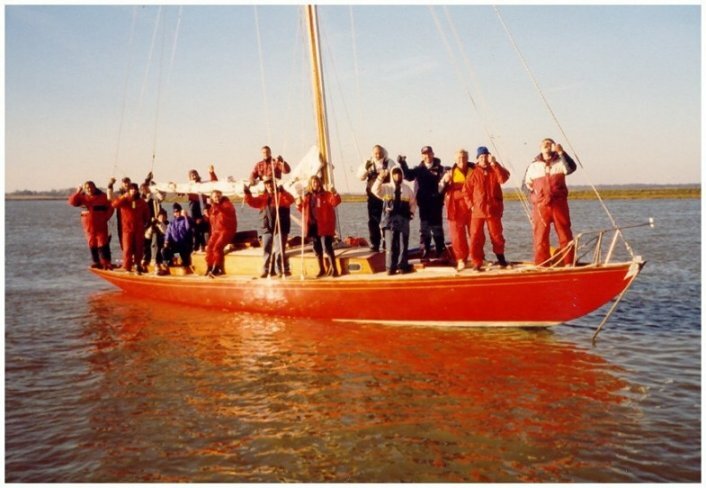 After the Second World War, Hiltgund arrived in England as part of a fleet of about 60 yachts (Operation Homeward) which were requistioned as war reparations (the windfalls). Around 14 ex-Luftwaffe yachts were also sailed over (Operation Sallyport) and about 100 other smaller craft were shipped from Germany to the UK. 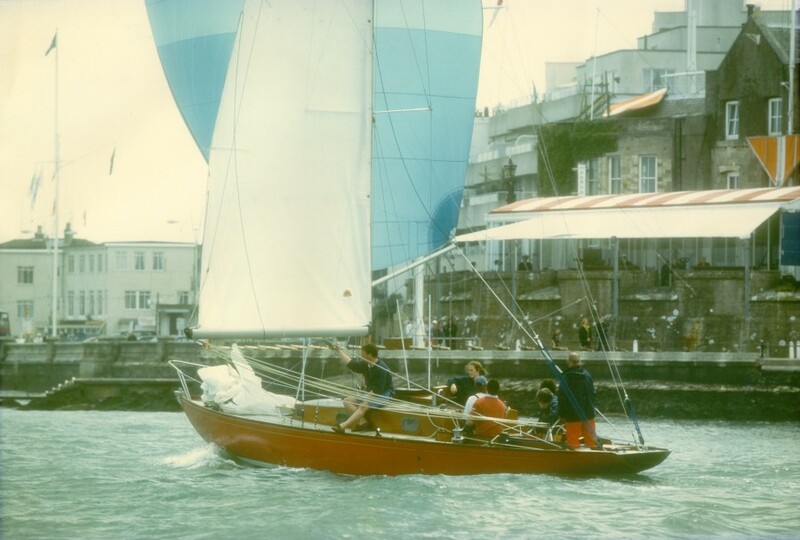 Hiltgund was renamed Pegasus and from 1946 to 1959, she was stationed at the Royal Naval College at Dartmouth where she was house yacht for "St Vincent". 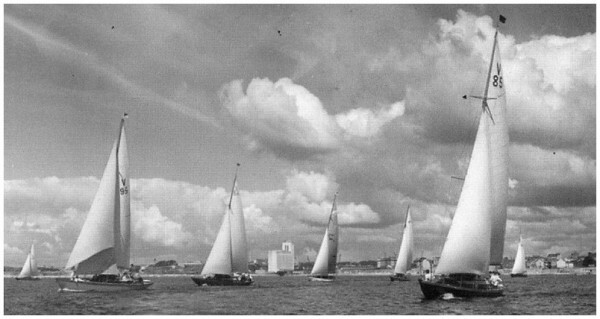 windfalls at the start of the Plymouth to St Malo Race - 1951 In a race on the 4th of June, 1949, she came 5th in a fleet of 10 Fifty Square Metres. 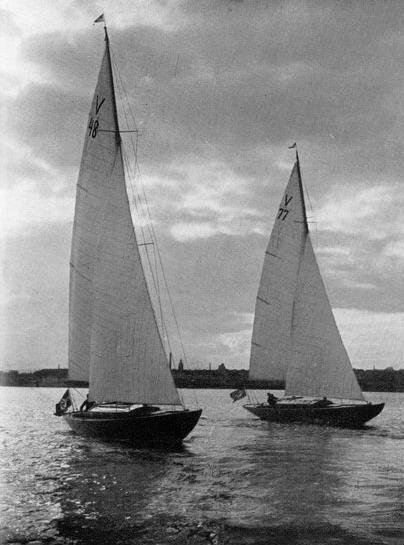 The event was a coastal race during an annual rally run by the College for which the Dartmouth 50s were joined by Windfalls (50s & 100s) from Portsmouth & Devonport. 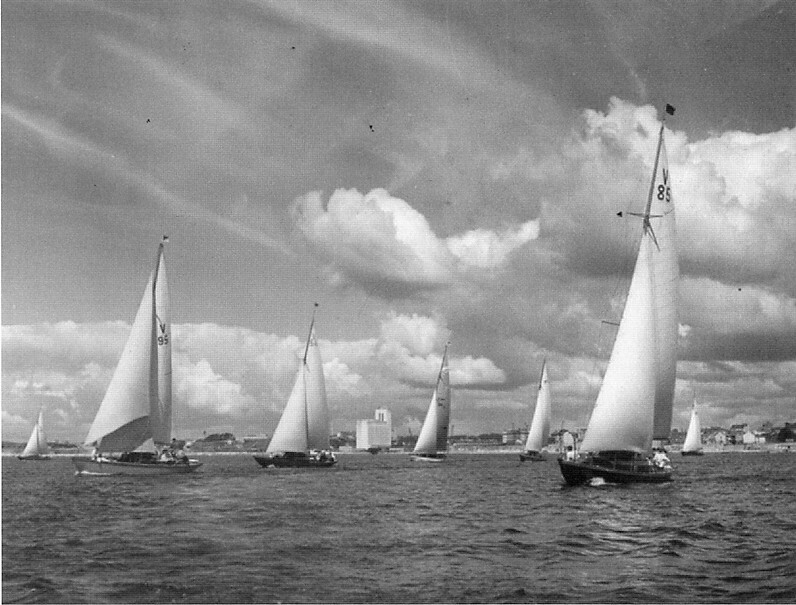 This rally and coastal race interrupted the routine Summer Term Saturday afternoon races sailed by the 6 College yachts, competing for the Hindenburg Trophy. 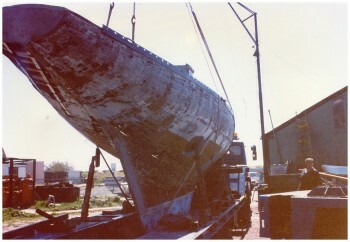 (The trophy was won at Kiel just prior to WW II by a naval officer.) 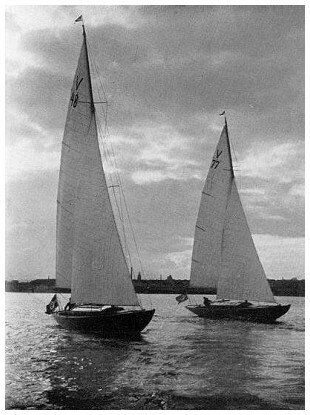 In 1949 Pegasus was second in the first two races and won the remaining eight. 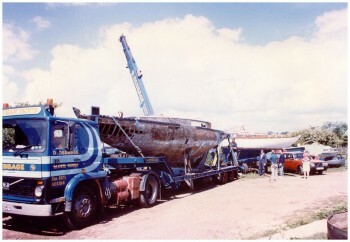 Around 1960, Pegasus was transferred to the Royal Naval Barracks at Portsmouth where she was possibly used by the Royal Marines and became known as Sea Victor under which name she continued until 1996 when she returned to her original name Hiltgund. 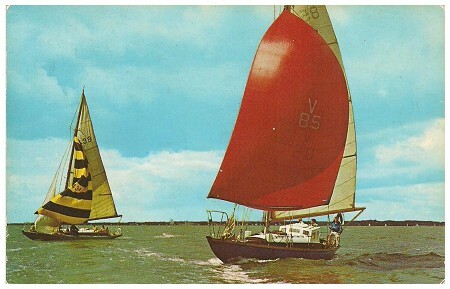 By the mid 1960s, Sea Victor had passed from the armed forces to private ownership. 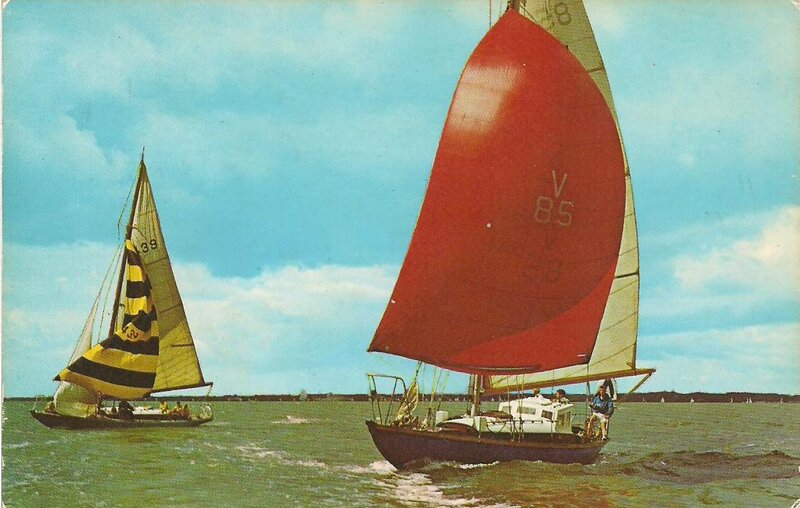 A RORC certificate of rating dated June 1966 gives the owner as Ewing Trawlers Ltd, Port St Mary, Isle of Man. 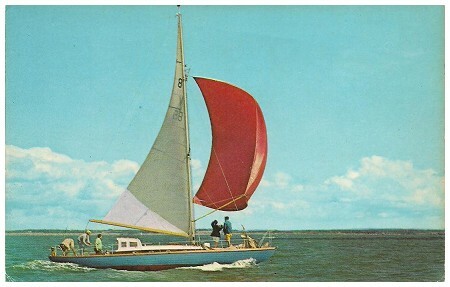 At around this time, Sea Victor was bought by Robert Francis Fryer who had sailed with Peter Beard and Donald Crowhurst. 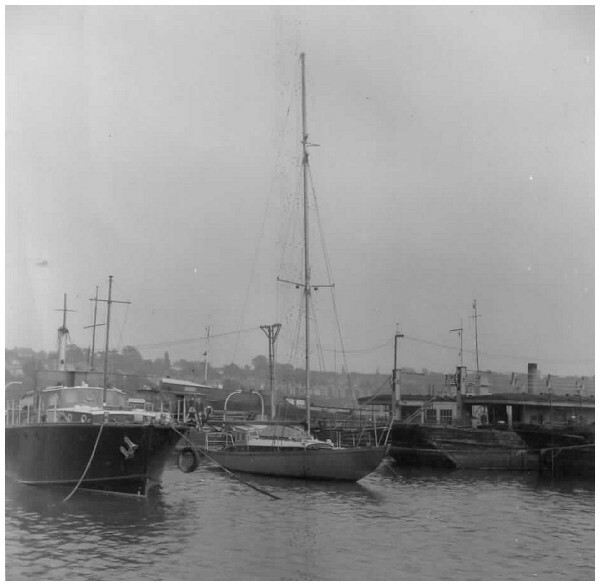 She was kept moored on the River Itchen in Southampton not far below the Vosper Thorneycroft yard. 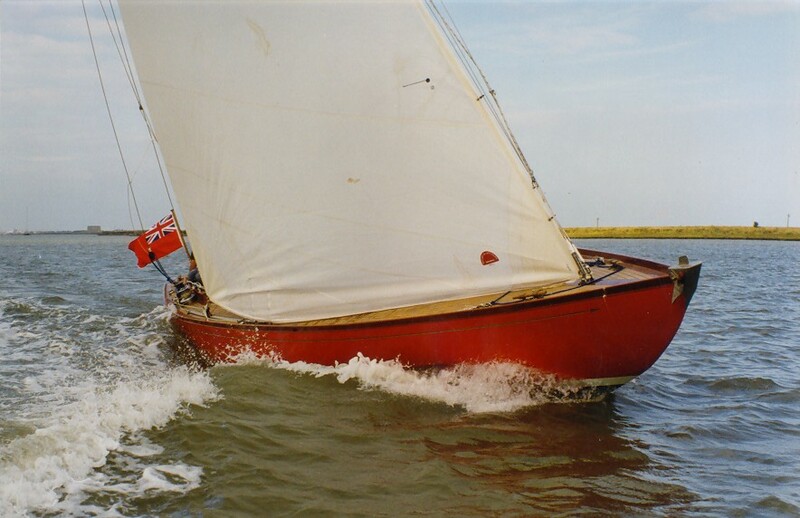 As Robert Fryer's family were not particularly interested in racing, she was mostly used for cruising along the south coast to destinations such as Weymouth, Poole, Portsmouth and the Isle of Wight and there were occasional voyages to the Channel Islands and France. 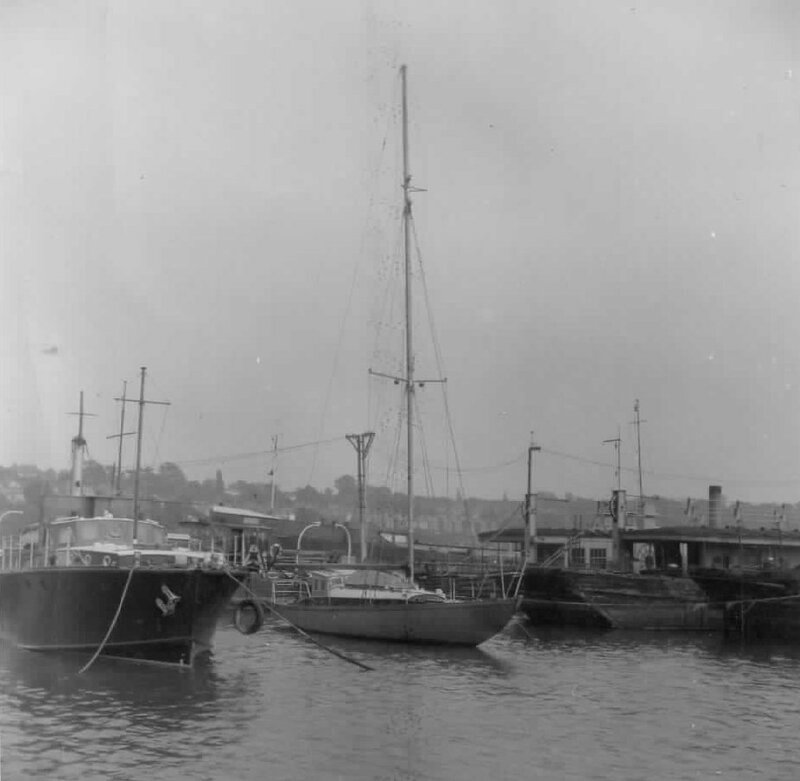 There was also a period of about six months when Robert Fryer's wife and 2 young children lived aboard while they were looking for somewhere to live in the Southampton area. 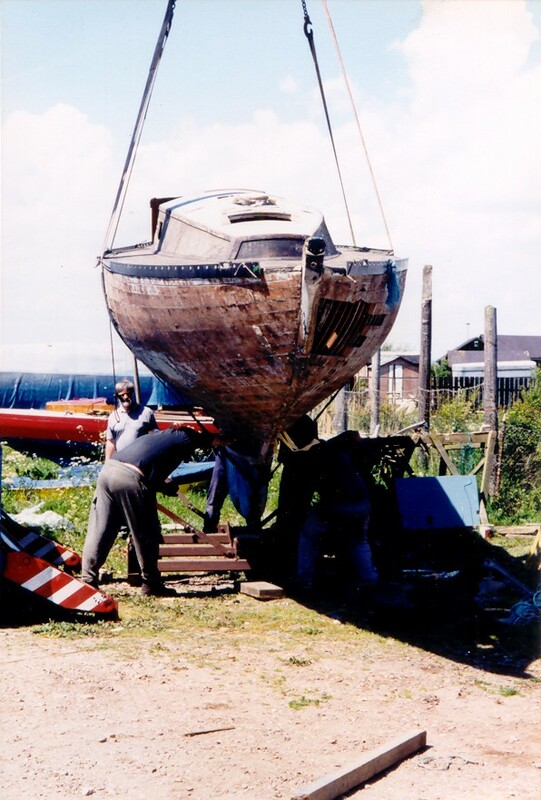 Changes in family circumastances caused the Fryers to part with Sea Victor in the early 1970s and it is thought that she was then not used much or looked after very well for a number of years. 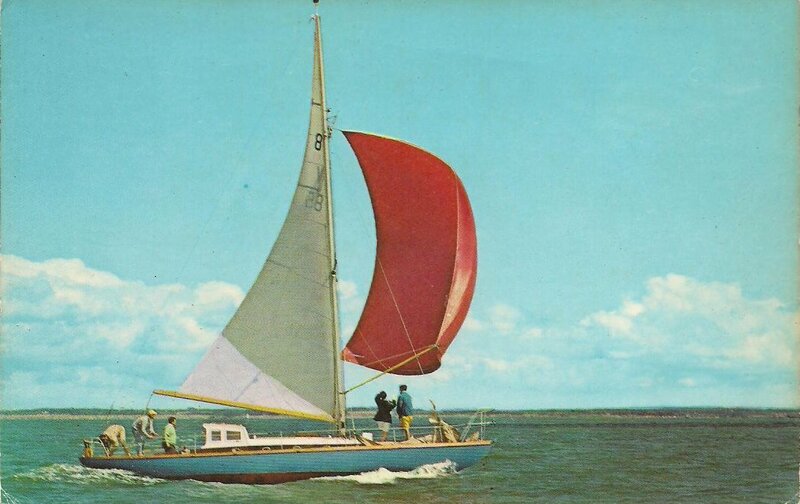 Painting of Sea Victor (Hiltgund) by Colin Richardson - the original hangs in Robert Fryer's son Henry's home. 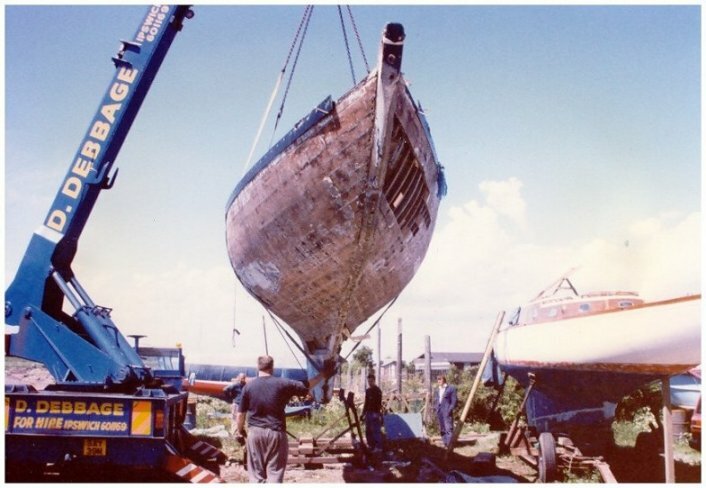 Nothing else is currently known until Sea Victor was bought by Nigel Gilkes in September 1977 as "an empty hull". 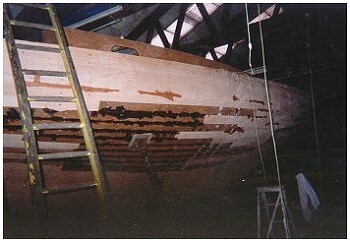 It would seem that a considerable amount of remedial work was then undertaken. 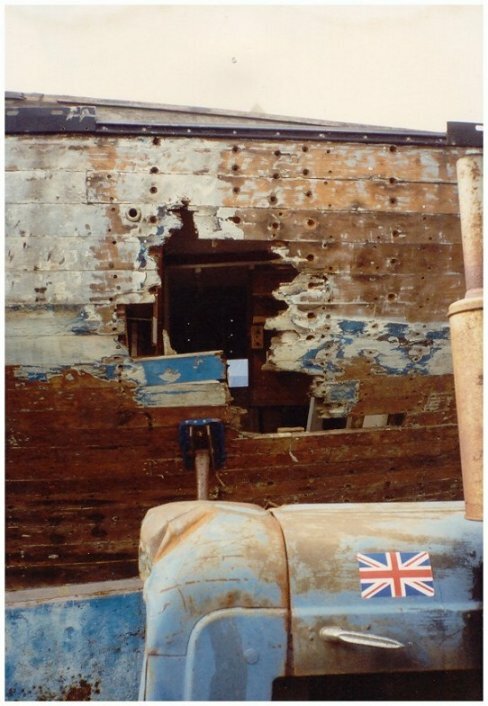 Certified as seaworthy by a surveyor in September 1980, it must be assumed that she then spent a least a few seasons afloat. 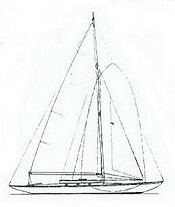 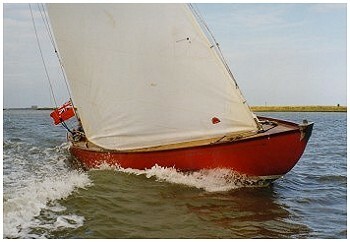 Nigel Gilkes parted with her in late 1984 and the particulars issued by Ancasta Marine Brokerage (Gosport) show a good inventory of sails (even if some were a little elderly), new spars from Procter in 1981, an engine and downstairs accommodation for 5 including galley equipment and heads fitted with a Baby Blake and washbasin. 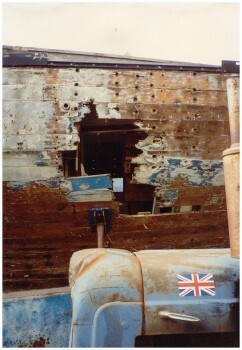 In 1990, she was acquired by Malcolm Brown who reports her to have been in a bad way - "just a damaged hull". 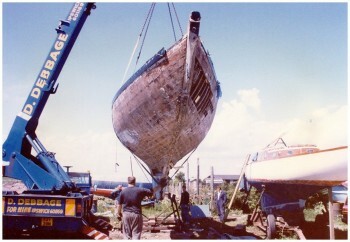 Regrettably, his plans to restore her were never realised. 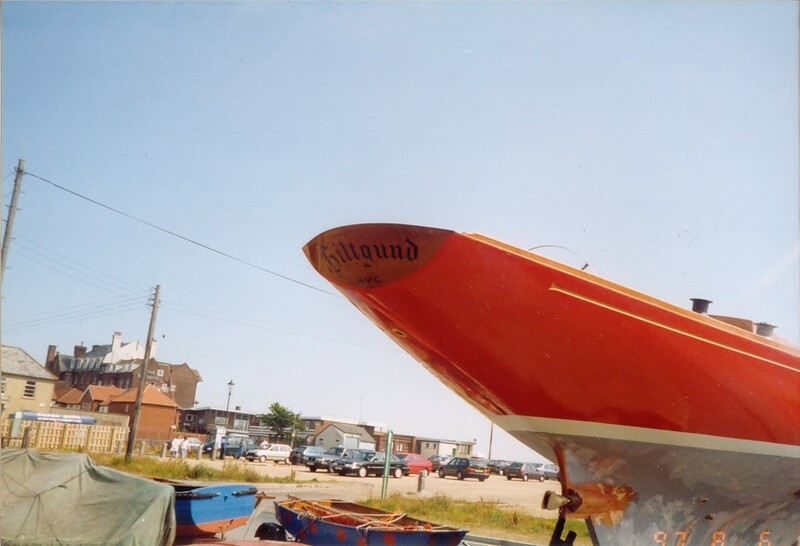 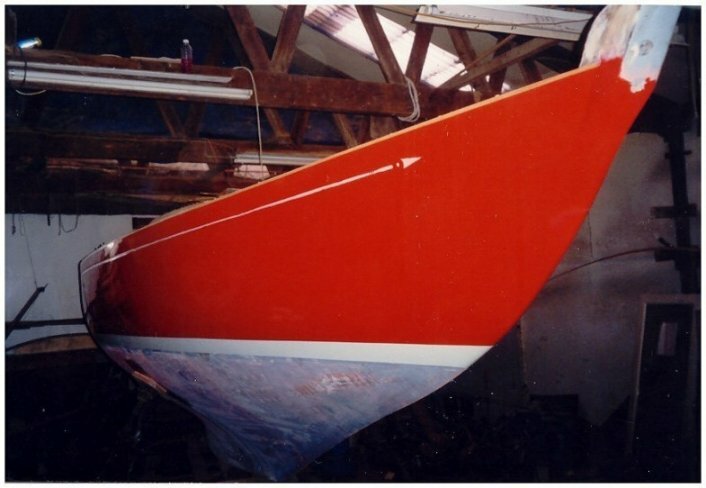 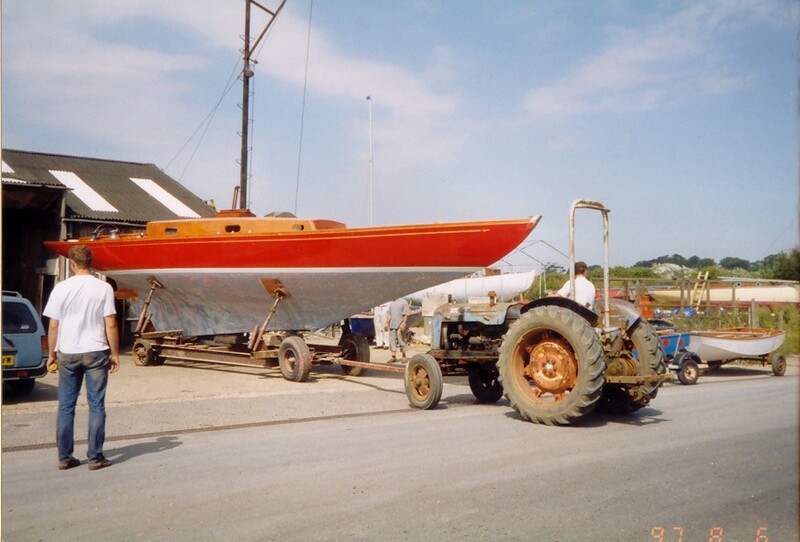 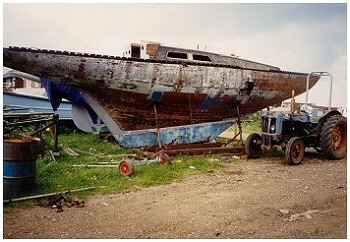 However, things looked up for her when Peter Wilson bought her in May 1995, changed her name back to Hiltgund and completely rebuilt her at the Aldeburgh Boatyard. 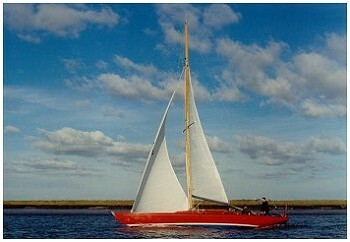 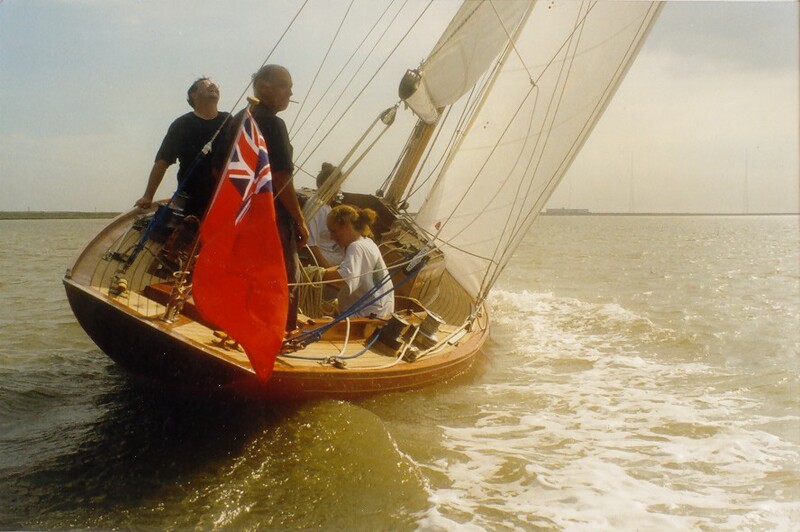 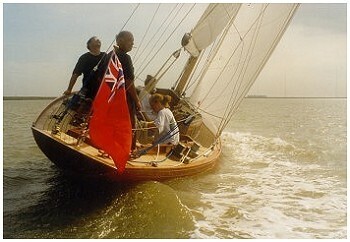 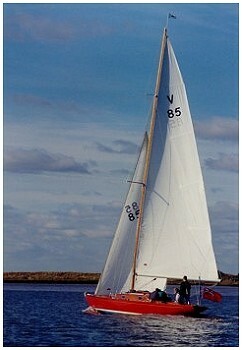 She was re-launched in 1997 and proved quick and seaworthy if a little wet in adverse conditions. 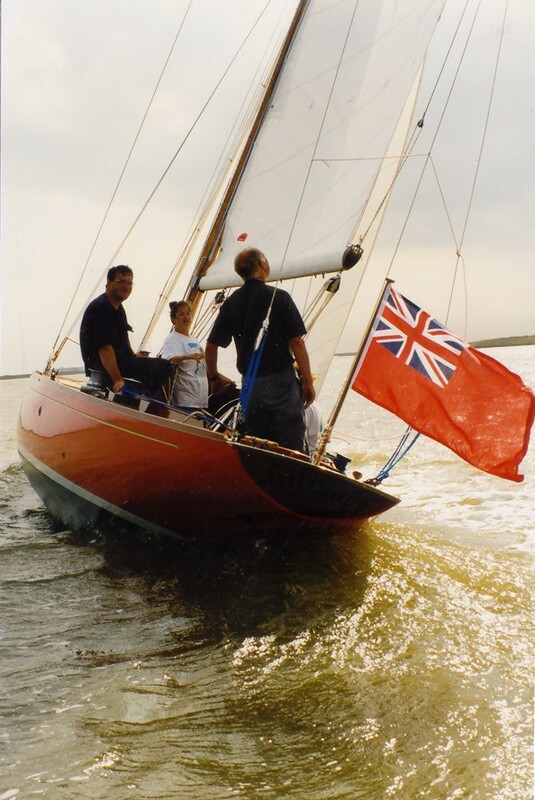 She subsequently enjoyed a successful racing career and in 1998 she was overall third in the Hermes Mumm Regatta. 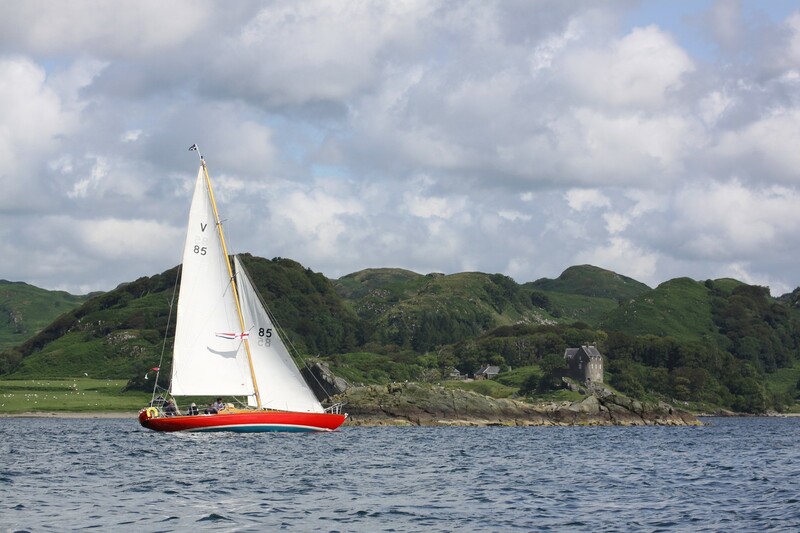 Since 2001, she has been cruised and raced by Chris Perring (and John & Gilly Bourke to 2005) on the West Coast of Scotland. 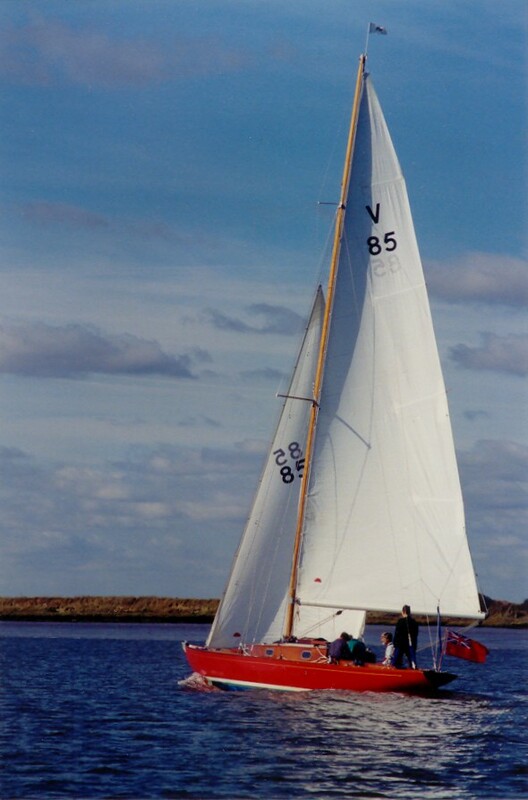 She has competed in the Scottish Series on Loch Fyne and the CCYC Round Shuna Race and taken part in the Crinan Classic Boat Festival on a number of occasions. 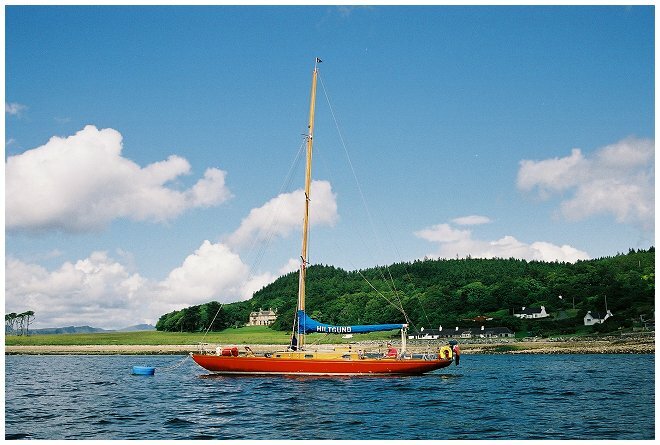 In recent years, Hiltgund has cruised between Northern Ireland, Skye and the Outer Hebrides. 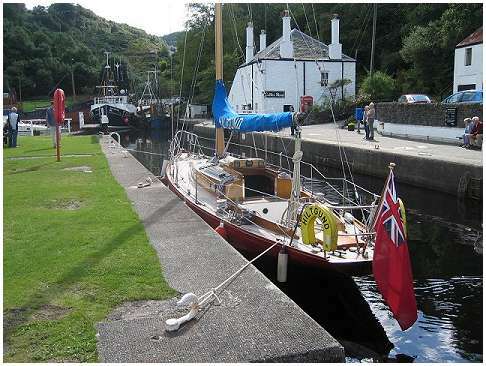 She is now based at Crinan near Lochgilphead in Argyll. 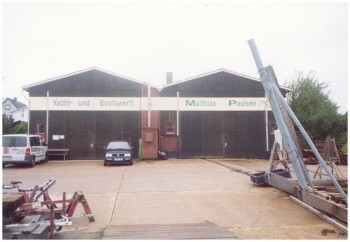 Above: The yard where Hiltgund was originally built, Matthiesen & Paulsen - near Kiel. 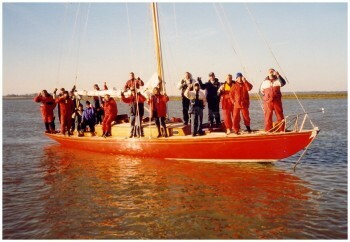 Out of the shed ..
.. and relaunched on the River Alde. 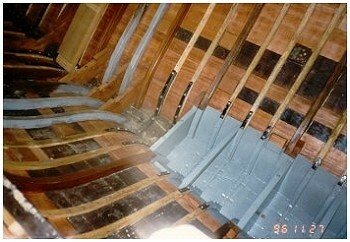 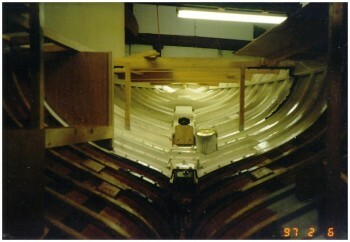 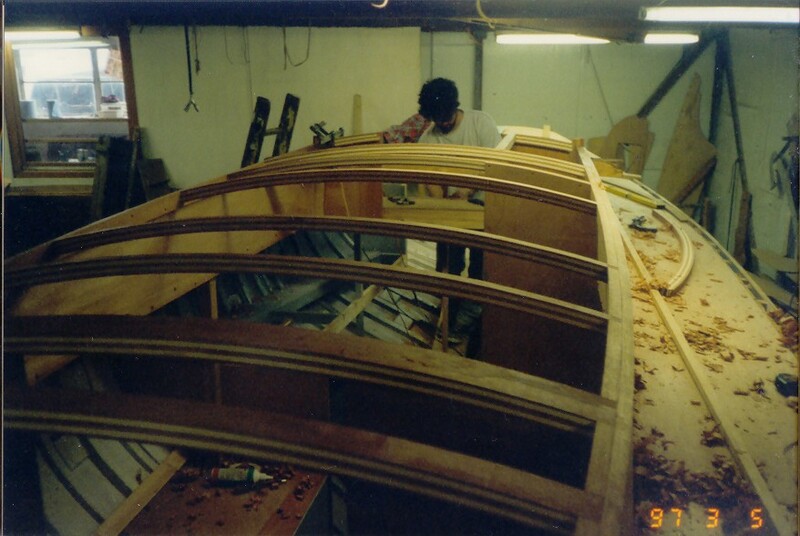 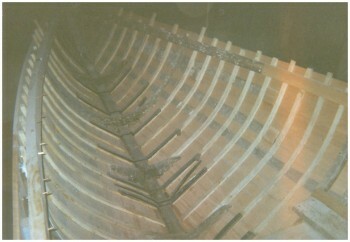 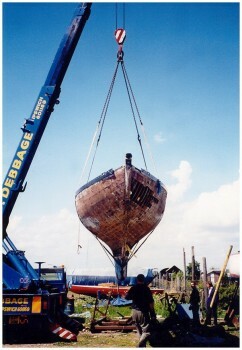 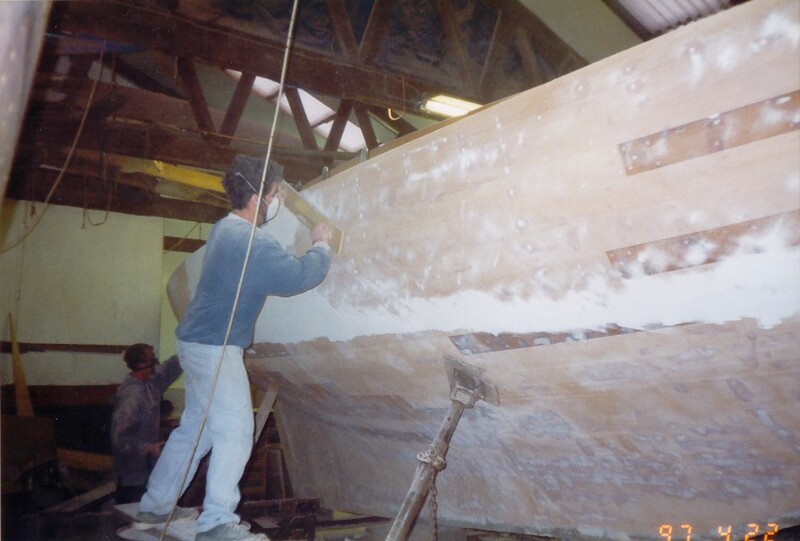 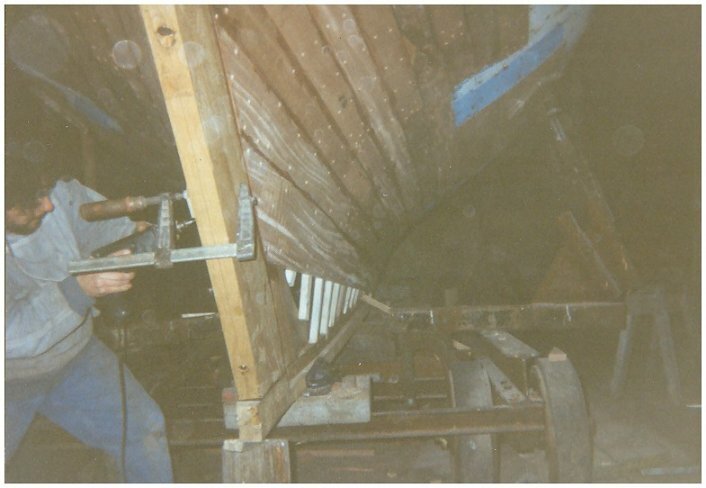 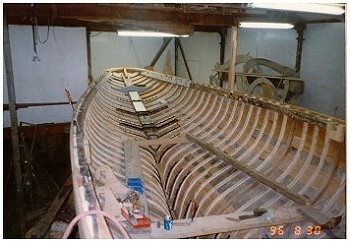 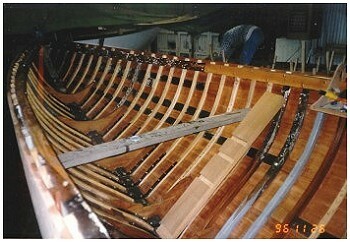 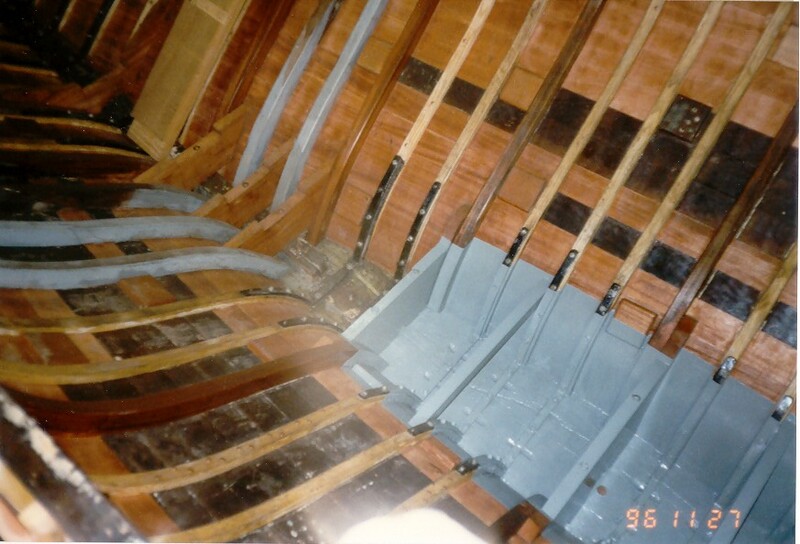 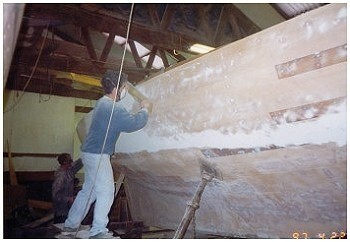 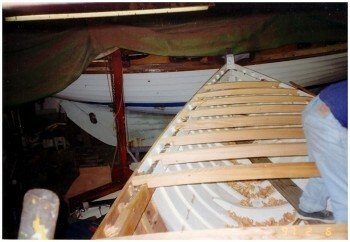 The Aldeburgh Boatyard company has been established for over 40 years. 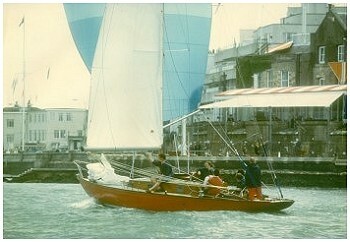 Peter Wilson took over the business in 1979. 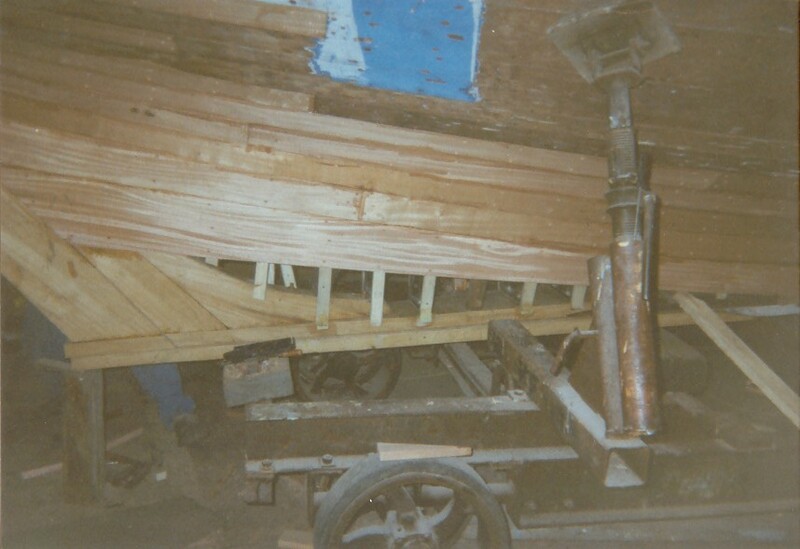 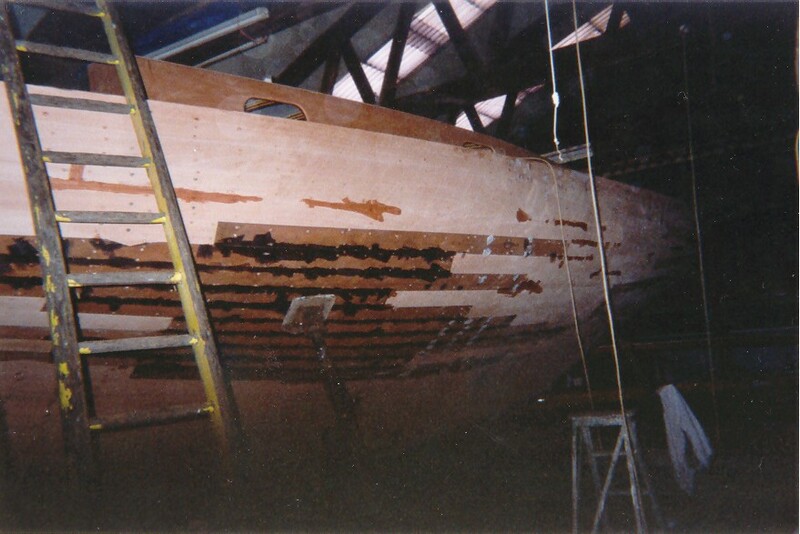 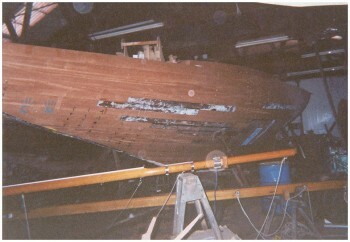 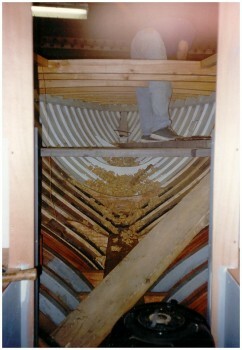 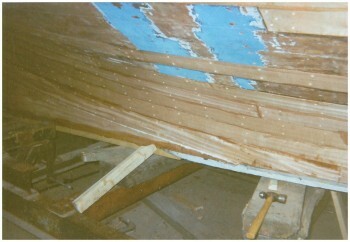 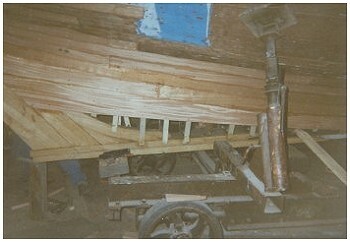 The yard specialises in wooden and classic boats. 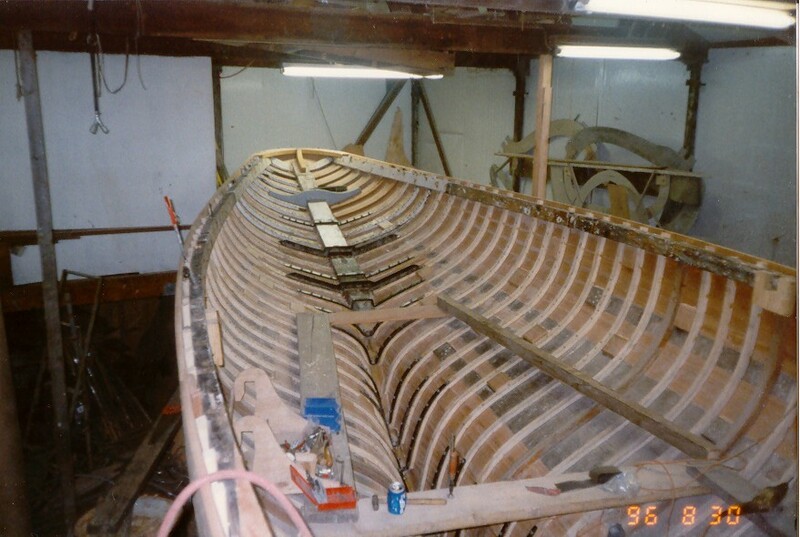 They build racing boats such as Dragons, Loch Longs and 2.4 metres as well as undertaking repair and restoration of old boats. The yard has an experienced workforce; their skills have been demonstrated on a number of boats that have been restored to their former glory. 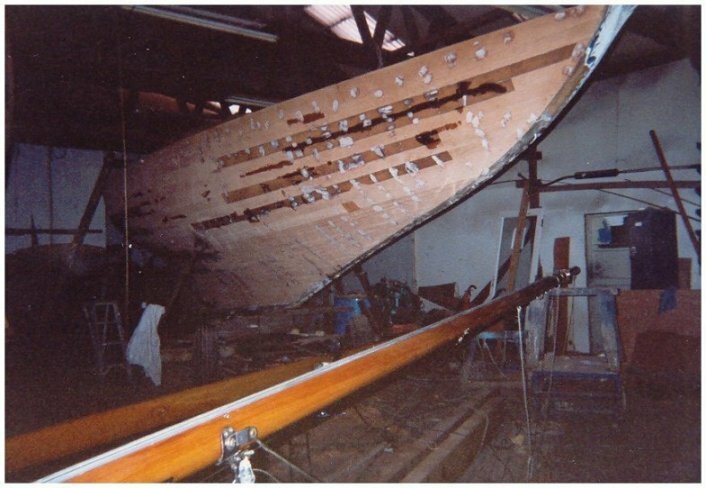 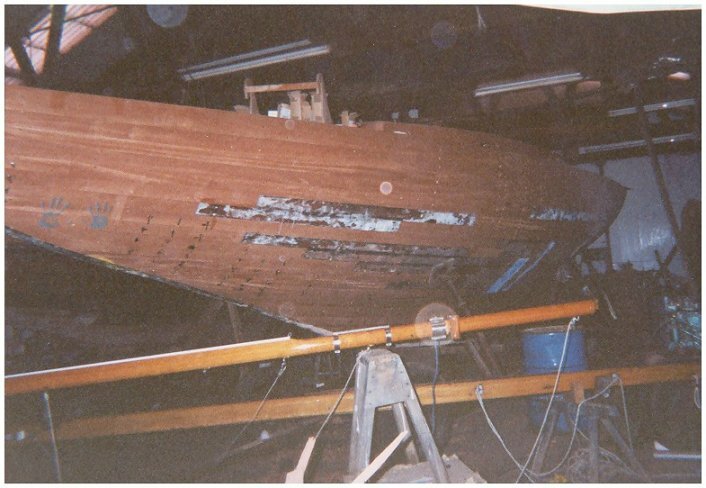 As well as restoring Hiltgund, the yard has restored the 30 Square Metre yacht Fara, the Eight Metre If, Gudgeon and many more. 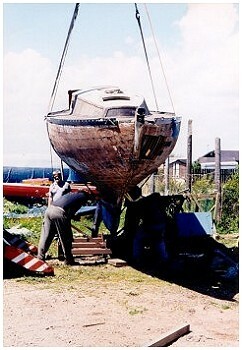 New builds include the replacement of Jester and a Modern Eight Metre Ganymede. 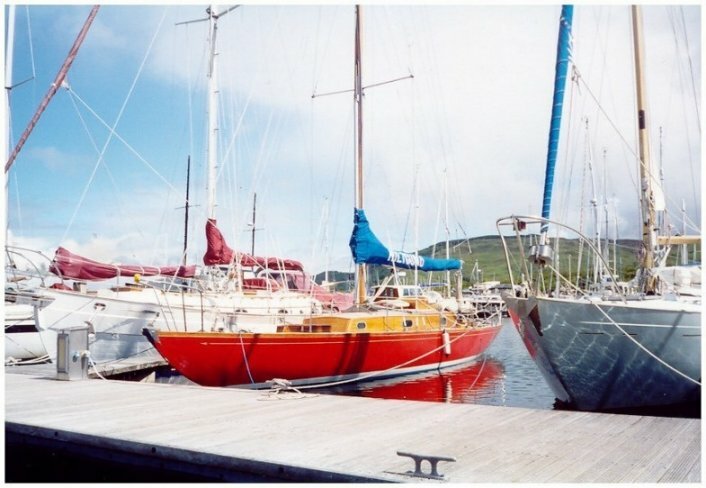 What does 50 square metre mean? 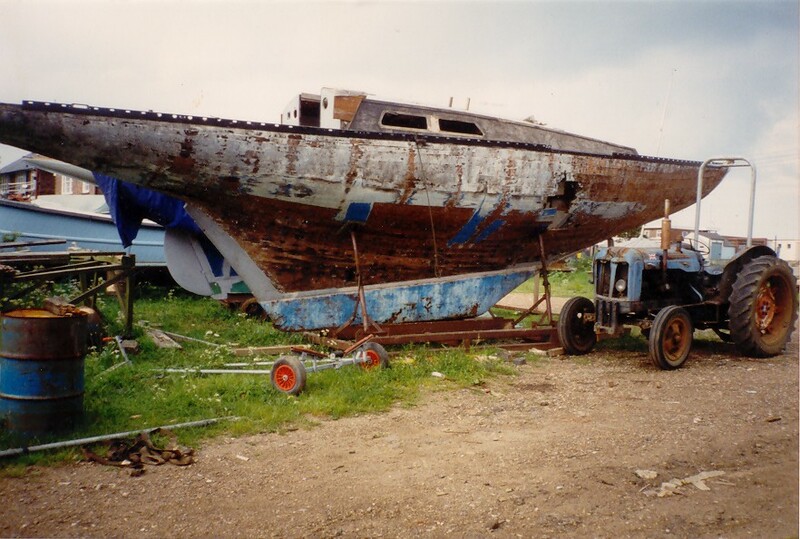 NOTE - your browser may try to block active content on this page in which case you might not be able to see the address given above - it should be fine to allow blocked content - it's the way the address has been coded to try to reduce spam address harvesting.